Sometimes, simple is what I crave. Back to basics. Like those rustic, cheesy tacos made by that Mexican expat in Costa Rica. Or the steaming bowl of jambalaya made by that New Orleans transplant in Fort Lauderdale. The crab cake sandwich at that dive in Tappahannock near the Rappahannock. Or my Oscar Meyer Braunschweiger. Or value priced cow tongue from my local Food Lion. But not really the tongue. Just makin’ sure you’re still with me. And I hope you are, because if you aren’t, you’ll miss out on the Puffy Taco Experience. And no one should miss out on the Puffy Taco Experience. 2. I really do love eating tacos. Just like hot dogs, I love all kinds. From fancified fish tacos I’ve eaten in Florida to the Beef Chalupa Supreme served at infamous T-Bells across the nation, I like ’em all. 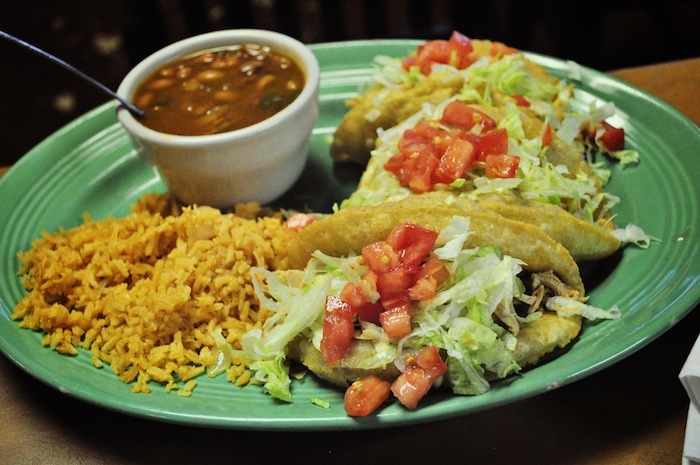 And Henry’s Puffy Tacos are no exception. 3. Don’t judge me for being a bona-fide T-Bell chalupa lover. If you’re unfamiliar with the chalupa, imagine a crispy-on-the-outside, doughy-on-the-inside semi-thick shell surrounding the questionable meaty, cheesy, sour creamy filling. Really. It’s all about the shell. So don’t knock it ’till you’ve tried it. In fact, does anyone know where I might purchase chalupa shells to use at home? Because I really think I’d like to eat chalupa shells at home. 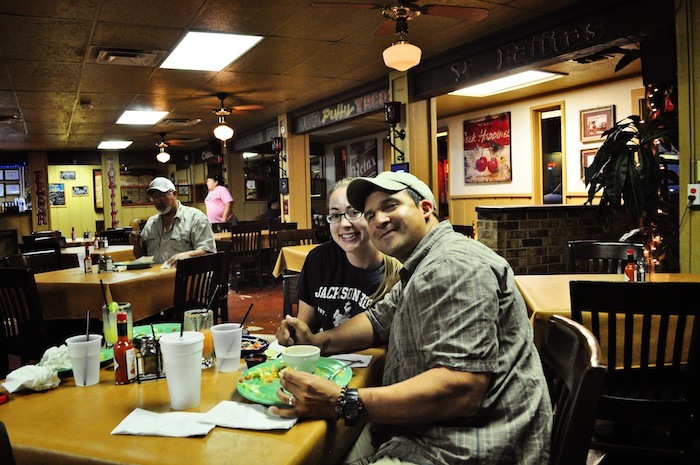 So during last summer’s trip to San Antonio, my local friend Stacy and her husband Victor treated me to some puffy tacos. In fact, Victor pretty much told me I wasn’t allowed to leave until I’d experienced the taste of one of his favorite childhood memories, and I’ll admit — I was a little concerned. Not because I didn’t trust Victor’s taste, but because sometimes — and this might just be the liverwurst talking — but sometimes, nostalgia has a way of “bending” a flavor so that while it tastes good to you because it brings back all kinds of swirly twirly memories from your youth, it might not actually be so fantastic to someone who didn’t grow up with it. And then the newbie is forced to either lie in order to preserve her friend’s youthful innocence, or crap all over a fantastic memory. I wasn’t sure which method I’d use on Victor. Especially when we pulled up to his old neighborhood joint and told us to stand close so we wouldn’t get mugged. So apparently there are currently two Henry’s Puffy Taco locations in San Antonio, and we went to the original. Well. Not really the original, since that one opened over 30 years ago and moved, then moved again, then closed and reopened with a different menu further away, and then opened this one again back near the original with the original menu. 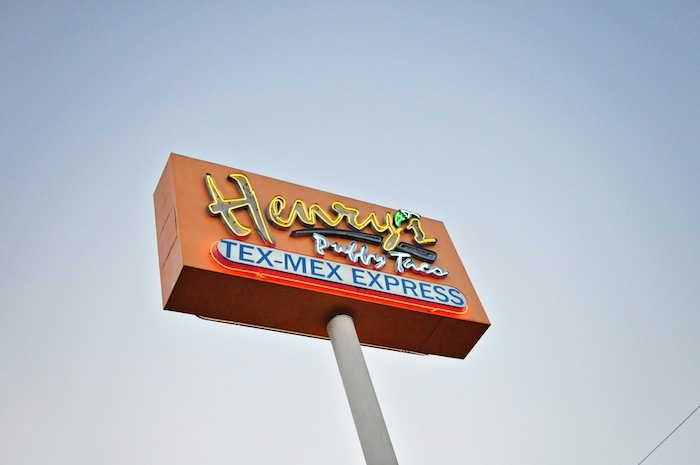 And Victor maintained that this one, Henry’s Puffy Taco Express, which preserves the original simplicity of the puffy taco, is the best. Fortunately for both of us, I didn’t need to lie or stomp all over Victor’s childhood memories. I can’t remember for sure what I ordered, but I’m thinking it was the shredded chicken puffy taco, followed shortly thereafter by the guacamole puffy taco. For a mere $1.95 a pop, who cares? While Stacy and I stuck to ordering our tacos one at a time, Victor went ahead and ordered the 3-taco plate, which came with some beans and rice. I didn’t try those, but here’s what I’m thinking: I’m sure they were fine. I’m sure they tasted like beans and rice. But, just like the taco fillings and T-Bell’s chalupas, it didn’t really matter. 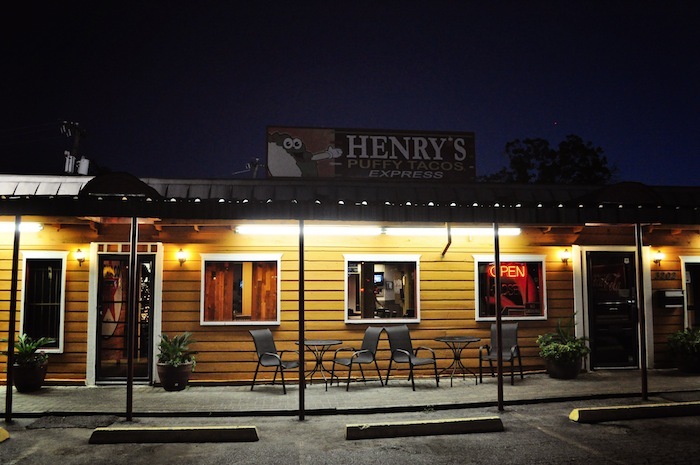 Because Henry’s Puffy Tacos are all about the shell. The glorious, puffy, shell. I’m not sure how they do it, but it tasted like crispy, fluffy, deep fried air. I could’ve eaten the plain, for all I cared, but the guacamole made it even better. The machine-made margaritas weren’t too shabby, either. Yet another reason I can’t stress enough how important it is to find yourself a local when you travel. Especially when you find yourself in a semi-shady ‘hood in Texas. Where everyone — including, if you’re lucky, your local — is likely carrying a concealed weapon. If it weren’t for Stacy and Victor, I would never have had a Puffy Taco experience. And while I may never have known what I was missing, I would have missed it, just the same. I didn’t even know of that ‘other’ taco reference. I’ve learned something new today! I love Mexican food! I grew up eating it all over the country and with being in California, you got to love it. I couldn’t get Mexican when I was living in Europe so every time I came home that was one of the first places I headed! 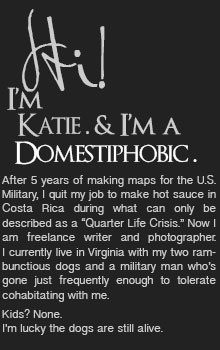 My hubby on the other hand has zero appreciation so I eat it a lot for lunch or when he isn’t around. 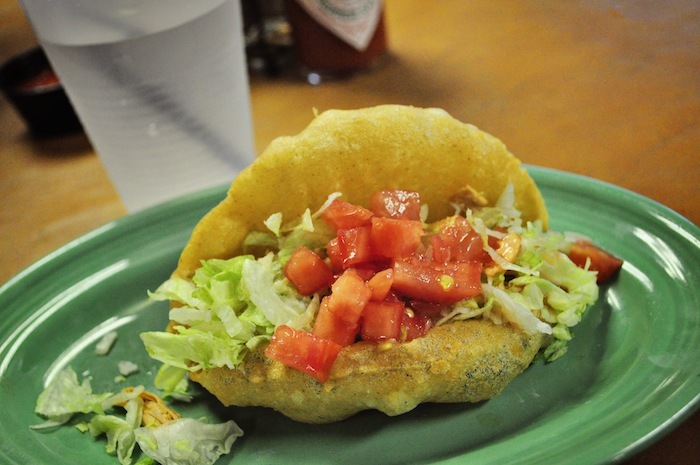 Haven’t had a puffy taco and now it needs to go on my must-try list!